PHL Industries, headquartered in Saint-Éphrem de Beauce, Québec, has received two contracts with a total value of $12.5 million for wood processing plants in the Mauricie and Gaspé regions of Québec. The first contract, for $5 million, was signed with Industries Parent, in the community of the same name in the Haute-Mauricie region of Québec. There are plans are to equip the Parent plant with two production lines fitted with a variety of equipment. The first production line will include a canter quad line system and a curve sawing optimized canter bull. The second production line, for sawn timber, will include an optimized single pass Hew-Saw. Delivery is scheduled for June, with start-up in July 2011. The second contract, valued at $7.5 million, was signed with Temrex Forest Products Inc. and provides for the supply and installation of two production lines at the Temrex plant in Nouvelle, in the Gaspé region. The first production line will combine a canter twin system, a curve sawing optimized canter bull and an optimized edger resaw. The second production line, for sawn timber, will include an optimized canter and a curve sawing optimized canter bull. Delivery is scheduled for October, with installation and start-up in November 2011. Both companies are regular customers of PHL Industries. The contracts, signed in April, ensure that 50 to 60 plant workers will be called back to work for several months. Koller North America has introduced the track mounted K702 tower yarder to loggers in Canada. This powerful and fast yarder is the largest in Koller’s lineup. Meant for 360 degree yarding uphill, downhill and on flat terrain, the 58,000 lb. machine comes with a 39’ tower with 10’ extension. A 214 hp Cummins engine and John Deere powershift transmission deliver 17,600 lbs. of average pull at up to 2160 feet per minute. Especially productive in thinning to clear cutting in medium sized cut blocks, the K702 can be towered down and towered back up logging again in 45 minutes, says the company. Hakmet is the new North American distributor for the Finnish AFM-Forest harvester/processor brand. AFM has been on the market for nearly 20 years and has a distribution network around the globe. It manufactures high-quality single-grip harvester, processor, combi and energy wood heads for demanding forest operations. The company’s harvesting heads have been developed in close cooperation with both customers and base machine manufacturers and can be installed on excavators, wheeled and tracked harvesters and forwarders. They can be found working worldwide, from Arctic forests to tropical plantations. AFM has a flexible manufacturing system allowing the company to design and manufacture machinery for individual needs. The company says its harvester heads can be adapted to all base machines and all conditions, including the most demanding forest conditions. It carries 10 different harvester head models. LMI Technologies, a market leader in 3D laser measurement sensors for industrial measurement and control applications, has sold 100 per cent of its shares to join AUGUSTA Technologie AG, a publicly listed German sensor and vision technology company. As a result of this acquisition, LMI will become part of a larger worldwide company in the field of digital imaging technologies. AUGUSTA is located in Munich, Germany, and focuses on two market segments—sensors and vision. LMI is a global leader in 3D sensor measurement technology for industrial measurement and control applications. Over 100 patents and 30-plus years of sensor expertise has gone into over 60,000 plus sensors and licensed products that operate in some of the harshest working environments imaginable. LMI’s technology supports the machine vision development needs of many of the world’s largest OEMs and system integrators in many industries, including wood processing. Within its vision segment, AUGUSTA is already leading the market in digital cameras for machine vision under the Allied Vision Technologies brand, with the company’s FireWire cameras ranked #1 and GigE cameras ranked #2. Through AUGUSTA, LMI is expected to expand its distribution channels for Gocator. This will help ensure Gocator is well positioned worldwide as a leading, all-in-one, easy to use 3D measurement sensor. Additionally, LMI will benefit from AUGUSTA’s extensive camera technology capabilities to further develop unique 3D solutions for its customers in new and existing vertical markets. The Great West Equipment Group has been awarded the exclusive distribution rights for Madill forestry products and parts for B.C. and the Grande Prairie region of Alberta by Nicholson Manufacturing. Great West Equipment Group is authorized to begin selling machines and offering service immediately, and selling parts no later than September 15, 2011. Nicholson bought the intellectual property, parts inventory and North American rights to the Madill line in late-2010 and began manufacturing Madill loaders earlier this year. Nicholson is providing the forestry sector with high quality purpose-built Madill log loaders, feller bunchers, and cable logging systems. Manufacturing of the Madill equipment is done at the Nicholson plant in Sidney, B.C. Nicholson Manufacturing has a 65-year history in the forest sector and is a global provider of log debarking systems and related products. Great West Equipment’s Vancouver branch manager, Bob Larter, will be heading up the Madill line. A former vice-president at Madill, Larter possesses invaluable knowledge of the Madill product line and customer base. As production ramps up, Great West Equipment expects Madill to become a significant part of their forestry business. Together with Great West Equipment’s Volvo and other forestry product lines, the Madill line will reinforce the company’s leadership position in supplying logging equipment to the B.C. forest industry. John Deere has added an Interim Tier 4 (IT4) engine option for its 744K 4WD loader that gives customers an industry first: the first piece of big iron to meet the U.S. Environmental Protection Agency’s (EPA) IT4 emissions regulations, according to the company. The John Deere PowerTech 9.0-litre IT4 diesel engine for installation in the 744K was certified by the EPA in March 2010 and uses cooled exhaust gas recirculation (EGR) technology to meet emissions regulations while producing the same 304 hp and big-time torque as a 744K equipped with a Tier 3 engine. Deere’s chosen technology path for meeting IT4 emissions, cooled EGR with exhaust filter, is a simple solution to help customers meet emissions challenges. The 744K IT4 machine has undergone thousands of hours of thorough customer testing in very harsh conditions. In Prudhoe Bay, Alaska, the 744K cleared snow and moved pipe in extreme cold. The 744K IT4 unit features all the other hallmarks of Deere’s K-Series 4WD loaders, including the Quad-Cool system and a multi-function easy-to-read color LCD monitor with onboard diagnostics. The NeverGrease pin joint option keeps joints tight longer for more productive operation, extending pin life overall and eliminating daily greasing. Single-side ground-level service makes daily maintenance easy. After more than a year of rigorous design review and extensive in-field testing, Morbark has released its new 3800XL horizontal grinder to the market. Not simply an incremental extension of the 3800 platform, this new grinder contains significant changes and improvements in feeding technology, which dramatically increases production capacity and operating efficiency. The primary difference between this unit and all others is its redesigned reverse-pivot feed system. It minimizes space between the feed wheel and the hammermill. There is no place for material to hide in this unit, which keeps debris moving forward with uninterrupted, steady production. The Morbark 3800XL is available with a variety of engine choices up to 800 hp. Logging residue can be an inexpensive and easily accessible source of biofuel, but to improve its energy content the logging residue must first dry on the ground and after that it can be stored in piles for several months. To shelter the piles from moisture through rain, snow and ice, Walki has developed a paper-based, waterproof cover that can be chipped and burned together with the residue. At first glance, Walki’s biomass cover doesn’t look very high-tech, but it’s an ingenious invention that very efficiently improves the energy content in logging residue. The cover itself is a four-metre wide laminate, mainly produced from renewable fibrous materials. It shelters the top of the pile but leaves the sides open, allowing moisture to evaporate. A very thin plastic layer within the cover makes it both waterproof and very strong, but thanks to the characteristics of the plastic, the cover can be chipped along with the residue and used as fuel as well. In addition to shielding the residue from water and snow, the biomass cover also protects the residue from freezing. Utility Composites Inc. offers a new 19 gauge composite staple and plastic cap stapling system for the timber processing and lumber industry. The new model RC-S/05 cap stapler is engineered to provide a 100 per cent metal-free fastening solution for lumber wrapping activities at the busiest sawmills, lumber yards and forest product companies. Extensive research with end users looking to improve their lumber wrapping quality identified several significant areas of need that UCI incorporated into the system. The RC-S/05 plastic cap lumber wrap system is said to be the only system on the market that offers 100 per cent non-metal staples with a plastic cap designed for holding poly, woven and polypropylene lumber wrap in all thicknesses. Weighing in at only 4.8 lbs. the RAPTOR RC-S/05 cap stapler accepts ½” crown 19 gauge RAPTOR composite staples between ¼” and 9/16” long and collated plastic caps 1” in diameter with a patented design for enhanced surface pressure and moisture resistant seals. The RC-S/05 cap stapler’s ergonomic design reduces operator fatigue and allows for increased production output. The easy to load magazine holds 240 plastic caps while the staple magazine has a capacity to hold 96 plastic staples. The tool offers a lock-out switch to shoot both staples and caps or just staples, as needed in the application. Great West Equip. now distributor for Sennebogen equipment in B.C. Canada’s West Coast will have a new level of support for log loaders, swing machines, scrap handlers and port equipment, with the appointment of Great West Equipment as the newest authorized distributor of Sennebogen equipment. Constantino Lannes, president of Sennebogen LLC, foresees a significant improvement in uptime and productivity for facilities as Sennebogen’s purpose-built material handlers increase their presence in the region. The Great West Equipment branches will serve a territory covering the southern interior and northern British Columbia, and reaching across to Vancouver Island, where the firm maintains two facilities. In the metropolitan area of Vancouver, Top Lift Enterprises continues to represent Sennebogen. Roger Dobie, corporate sales manager of Great West Equipment, welcomed the opportunity to expand the company’s range of equipment solutions for customers. 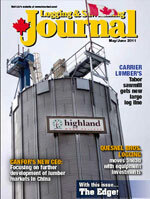 “The forest industry has been changing, with fewer mills producing higher volumes,” Dobie explained. ”We have been looking for a purpose-built material handler to help customers replace wheel loaders for loading and stacking in their yards. Swing machines like the Sennebogen green line log handlers can help our customers make better use of their space for inventory. Today, we’re in a much better position to be their one-stop source for equipment service. “Sennebogen will definitely help us open new doors in log-handling, scrap recycling and port applications,” says Dobie.